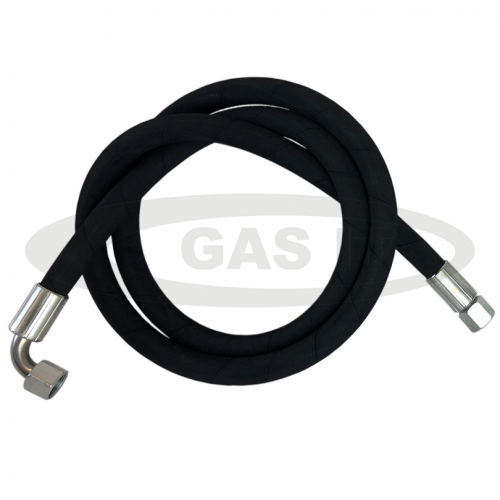 gas it, straight/angled 1.00 mtr fill hose, GI-FH-14 - GAS IT Leisure Gas Bottles, Gas Cylincers and Gas Tanks - Catering, Motorhome, Campervan, Caravan, Farrier and Road Repair Refillable Gas Solutions. 1.0 mtr SAE Fill Hose 'Hydraulic Style' E67.01 Hose with Straight and an Angled end. The Angled and Straight hoses are the most commonly used fill hoses and are the type as used in all our Bottle and Tank build kits. We do have SAE Fill Hoses with Straight fittings on both ends listed on our webshop. The sealing faces on these certified and homologated fill hoses are 45 degree to exactly match the sealing faces on LPG Fill hoses, Fill points & Fill connections on all certified refillable gas products.